We're doing a trip on the Little French River starting & ending at the Dokis Marina, going around Okikendawt Island via the Free Flow Channel, to Five Finger Rapids and turning back east up the main channel of the French River to the Chaudiere Dam. The French River PP map shows portages at Five Finger Rapids & the Chaudiere Dam, but none at the Free Flow Channel. A trip report I read last night seems to indicate that the channel is actual a small canyon or gorge that needs to be portaged. If anyone has paddled this area could you please comment on this, in particular if there is a portage and where it is. It's short and a smooth carry. Wow, that IS the one I remember. I also recall losing half our remaining food, our cooking pots and pans, a fishing rod and our only camera lining up cedar rapids on our last day. It proves that fond memories made in the outdoors last a lifetime. of the gorge are of free flow and it definitely requires a portage... funny that none is indicated in the PP map... going to look at an update version tomorrow.. I was looking at doing that loop earlier this year. It looks like a fairly quiet route by FR standards. My wife and I have been trying to minimize portaging as we are at bit older. Ideally we would have been able to park at the dam, do the loop CCW, take out below Upper Chaud, then walk to the dam to get the vehicle. That didn't seem possible, although I didn't pursue that option too vigorously. The other option I considered was using my canoe cart and pull our loaded canoe along the road rather than the portage(I assume the port is not along the road. Have you considered either of those, or are you young and strong and not bothered by ports? Our group consists of 3 guys in their mid- fifties & 3 in our early 60's. Day 3: do 300 m portage around Five Finger Rapids and paddle to just south of the Free Flow Channel & stay there 2 nights. 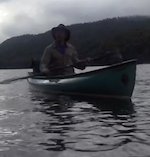 Day 5: do the 50 m portage around Free Flow Channel & paddle back to Dokis Marina. I think you are going in the wrong direction. When I was doing my homework for this trip I read a comment by Erhard that there is significant current on the Little F. so he recommended going CCW around the loop. I was wondering about that... can anyone comment on whether it would be difficult to paddle up the Little French River from Five Finger Rapids to the Free Flow Channel area. PM Erhard---he's done that loop. I'm curious as to what advantage you see in paddling CW around the island. Re parking at dam---My hope was that I would get official permission from the Dokis band to park there. I sent them an e-mail but got no response. If I were to go there I would check it out in person, though. Where did you get your info on portage length. My FR park map doesn't have that info. Is the port around the dam on the road or thru the bush? This trip completes the eastern part of the French River for our group so we want to do it all..
As for the CW approach from the Dokis Marina, our m.o. for a 5 day trip now that we're getting a little older is paddle 1 day, layer over 2 nights, repeat and paddle out on day 5. The paddle to Five Finger Rapids is shorter going CW vs CCW ( 15 km vs 25 km ) so that's why we chose it. Erhard replied to my pm saying his memory of how much current is on the Little French is fuzzy but he remembers some current & swifts... but he said to give it a try anyway... I'm going to bring that forward to our group, but we will most likely still go CW. Re: parking below dam... it appears from the FR PP map that all the Chaudiere dams ( there are 3 ) are accessible by roads on crown land so I don't think you will need band permission to park... it looks like you could park a vehicle below the dam that is furthest south ( and easiest access ) after you cross over the river. This would put you below the rapids and from the Google Maps Earth view there appears to be an easy put-in point near there. This would get you on the Main channel of the French River. As for the portage: It is shown on my new FR PP map in a bay on the south side of the 3rd dam (just west of Casa Blanca Lodge ) as 600 m and appears to be a trail and not on the road. Will let you know how the trip went..
2 I have no idea how big the rapids are below the main dam, but I guess you are going to find out. While the path to a spot above the rapids may be a shortened version of the port. it could also be a footpath to someone's favorite fishing hole. 3. Why try to cross the river at the bridge? Maybe you can line the rapids, then paddle from there. I don't see any more rapids marked downstream other than the set you mentioned. I will look forward to your report. BTW--5 mile bay and Hall River look worth exploring.